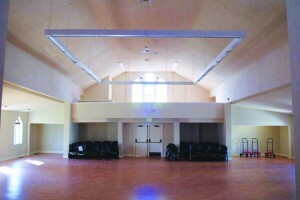 Southside Commons is owned and operated by the non-profit, Alliance for a Just Society. Space in the building, located in historic Columbia City, in Seattle, is available for rent by the hour. Typical rental uses include wedding receptions, community meetings, political gatherings, town halls, movie nights, baptisms, birthday parties, and theater productions. We have a stage! Our main floor room holds up to 200 people. We also have tables and chairs available for use. In addition, a spacious kitchen with a six-burner gas stove, refrigerator, and utensils is available for rent in conjunction with the activity space. Wi-Fi is also available for your use. Southside Commons was originally the Columbia Baptist Church, built in 1907. The original wooden building was substantially renovated in the 1930s, resulting in the structure you see today. ← New Amenities at Southside Commons!